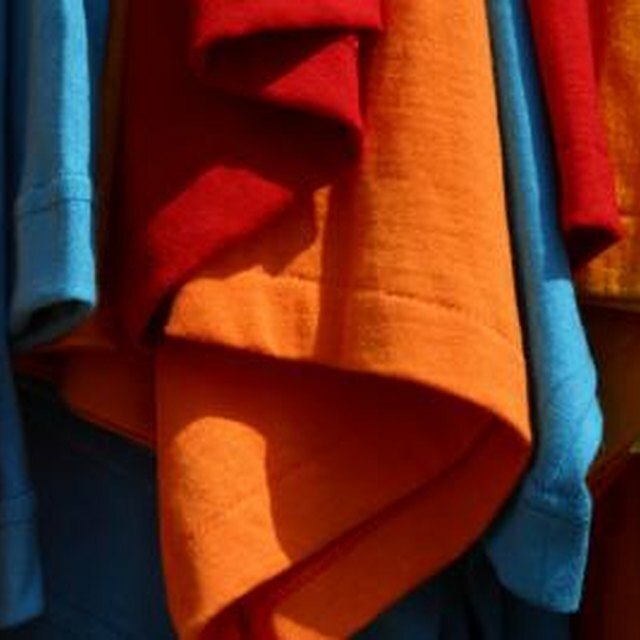 Professional mechanical machines exist that can print hundreds of t-shirts per hour, but they're not the only way to print t-shirts. Hobbyists and artists looking to print only a small quantity of t-shirts can build their own t-shirt machines that they can use effectively to produce as few as one printed shirt. Build your own t-shirt machine to create custom designs. These simple screen-printing machines can also be used to print on other surfaces such as leather, paper, glass and wood. Measure along one of the 24-inch sides of the plywood sheet to find its center. Measure two inches from that point and mark the location with a marking pen or pencil. Measure six inches from this spot and mark it with a marking pen or pencil. Repeat this step for both sides of the plywood sheet. Center each hinge at the mark you made in Step 2 and trace the shape of the hinge on the wood with a marking pen or pencil. Mark the location of the hinge screw holes so they're easy easy to see for drilling later. Drill starter holes with an electric drill in the spots you've marked as the holes for hinges. Place the hinges over the holes and screw them down the rest of the way with a screwdriver until they sit flush with the wood sheet. Don't strip the holes by over-tightening. Install a screen printing frame made by stapling sheer nylon fabric to an 18x24-inch picture frame without glass by screwing it to the other end of the hinges. Clamp the frame down into position with g-shaped clamps.